Embracing what God does for you is the best thing you can do for Him." This is AMAZING! In honor of the monopoly game celebrating its anniversary, a maps has been created showing the true locations of the monopoly properties! That is the perfect word to describe the movie "Truth Be Told." As a member of Team Buzzplant, I was given the opportunity to pre-screen this movie which airs Saturday, April 16th on FOX at 8/7c. Watch it! You wont regret it! 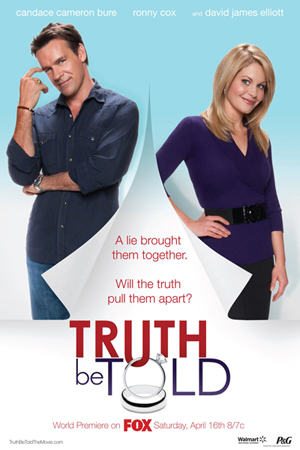 Candace Cameron Bure is adorable and David James Elliot is a charmer, so grab the family and hang out on the couch in front of the tv this Saturday night and experience a movie that you'll likely want to watch over and over again! Watch the trailer here: http://www.youtube.com/watch?v=HsbYUg-FyNc! Also, you have the opportunity to enter a contest to win a $100 Walmart gift card! Imagine all you can buy for that! Remember, this Saturday, at 8/7c on FOX! Love is based on God's command to love, not the recipient's worthiness. This very thing is a picture of the gospel. What are you, an undercover Christian now? You've been working at this company for two weeks now and do people even know you are a Christian?! You need to do something about that. Let your light so shine before men that they may see your good deeds and praise your Father in heaven (Matt. 5:16). Be a trader. On Wednesday, I had a movie moment with a hott man. The elevator door opened. He got on. We went down to the first floor and walked out of the elevator in the same direction. He held the door open for me. We ended up walking out of the building in the same direction. We kept walking just to find out we were parked right next to each other. He must have noticed the humor in the situation also because he started laughing and said, "Have a good night!"